Early nutrition is the key to lifelong health. The “developmental origins of adult disease” hypothesis first proposed by David Barker in the late 1980s drew attention to the role of intrauterine nutrition on the later health of the child. The Barker hypothesis states inadequate nutrition results in permanent changes in the foetus’ physiology and metabolism. These adaptations, it’s thought, equip the foetus for postnatal life in an environment of nutritional deficit. So, low birth weight (but not pre-term) babies, who are later exposed to excess – as is the case of most economically developed societies – are more prone to developing diabetes, hypertension and heart disease in adulthood. But eating too much during pregnancy is not recommended either. Maternal obesity is also associated with the risk of chronic disease in the offspring. But advances in scientific knowledge like this one have sadly meant pregnancy has moved from being considered a natural life stage to a state that requires medical management, with strong parameters around risk reduction. This shift has been accompanied by societal judgement that considers women responsible for the poor health of their children. Popular media perpetuates this with headlines such as “Obese pregnant women risking babies’ health”. And then there are non scientifically-trained celebrities, who nonetheless get to air their opinions. Consider chef Pete Evans who attributes autism to maternal diets, even when the diets comply with relevant guidelines. There’s plenty of pressure on women to do all the ‘right things’ during pregnancy to have a healthy child. All this places pressure on women to do all the “right things” during pregnancy to have a healthy child. It also results in women feeling judged about their decisions and becoming extremely risk averse. You’d think all this pressure stems from the fact that women receive lots of good nutrition-related advice during pregnancy so they can make informed decisions and limit risk. But this is not the case. Pregnant women receive conflicting information about nutrition, and are often confused by the mixed messages they get from health-care providers, the media and the internet. 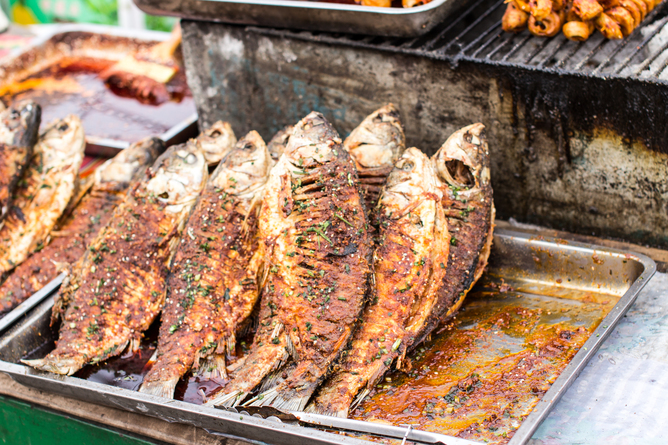 maternal consumption of fish during pregnancy is likely to have a number of health benefits for women and their children. But research shows many women may be avoiding fish and seafood during pregnancy because of concerns related to food safety and the detrimental effects of mercury. Although both can be eaten as long as they have been well cooked and served hot, and when larger species (shark, marlin, swordfish) are limited, women report avoiding these foods altogether. Advice about fish and seafood is one example of how women are not getting the right guidance about what to eat during pregnancy. Much of the educational material given out in antenatal clinics emphasise the risks of fish and seafood consumption also, without highlighting their nutritional benefits. This is just one example of the kind of coupling of risk aversion and limited advice that work together to promote less than ideal nutritional outcomes in pregnancy. All in all, the causes of poor nutrition in the preconception and pregnancy stages are complex and multifactorial. They may be related to poor education and low income, inadequate access to proper health care, and a general lack of awareness about nutritional requirements. To address it, we need an approach that encompasses both individual education and “upstream” public health initiatives. In Australia, pregnant women are not routinely referred to allied health professionals such as dietitians, which means it’s often left to midwives to provide them with nutrition-related advice. But midwifery degrees are not required to include nutritional content, so midwives are clearly ill-equipped for this task. General practitioners, who are often the first point of call for women when they get pregnant, and who may continue caring for them throughout their pregnancies in shared-care models, are also failing to provide essential nutrition information. If we’re going to help pregnant women ensure they’re eating right for themselves and their babies, we will need to start by educating health professionals who they encounter throughout their pregnancies to provide clear nutritional advice. This guidance should address myths about food risks and emphasise trustworthy sources of information. And whatever else they do, it’s vital our messages aren’t about blaming soon-to-be mothers.